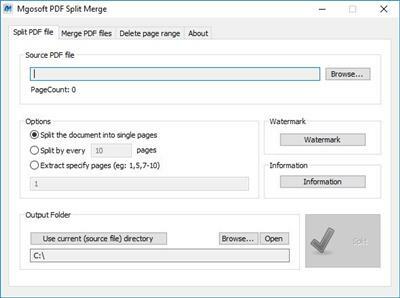 Mgosoft PDF Split Merge is a simple, stand-alone application that lets you split any Acrobat pdf file into smaller pdf files or combine two or more Acrobat PDF files into a single PDF document. Mgosoft PDF Merger is a simple, stand-alone application that lets you combine two or more Acrobat PDF files into a single PDF document. Mgosoft PDF Merger provides numerous alternatives for special merge methods that allow you to combine documents and document parts in a number of different ways to make your work more effective. 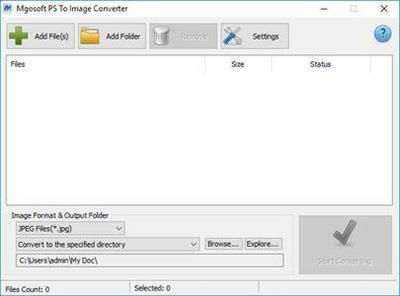 Mgosoft PS To Image Converter is a fast, affordable way to batch convert PostScript (PS) files to image formats. It directly convert PS files to dozens of image formats, such as TIFF, JPEG, PNG, BMP, PCX, GIF, WMF, EMF, TGA and so on, it retains the layout, images, text, line, ellipse, color, and formatting of the original PS file. Mgosoft PS To Image Converter does NOT require the third part products, and original PS formatting and interrelation of text and graphical elements on each page. Creating documents which can be viewed on any computer with a Image viewer. And you can set the image quality, image color, image resolution, etc. Mgosoft PS To PDF is a simple tool that supports converting PostScript (PS) documents effectively, into Portable Document Format (PDF) format files. Mgosoft PS To PDF facilitates the conversion of PS documents into well-known PDF format files without sacrificing content while giving quality output. It is capable of generating optimized, high quality, and vector-based PDF format files as output out without going over GDI, or going through PDF printer driver. Mgosoft PS Converter is a fast, affordable way to batch convert PostScript (PS) files formats. It directly convert PS files to Portable Document Format (PDF) format and dozens of image formats, such as TIFF, JPEG, PNG, BMP, PCX, GIF, WMF, EMF, TGA and so on, it retains the layout, images, text, line, ellipse, color, and formatting of the original PS file. 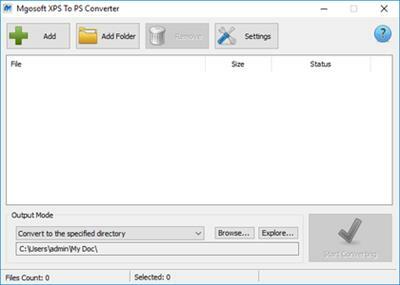 Mgosoft XPS Converter is a fast, affordable way to batch convert XPS files formats. It directly convert XPS files to Portable Document Format (PDF) format and dozens of image formats, such as TIFF, JPEG, PNG, BMP, PCX, GIF, WMF, EMF, TGA and so on, it retains the layout, images, text, line, ellipse, color, and formatting of the original XPS file. Mgosoft PDF To JPEG is a fast, affordable way to batch convert PDF files to JPEG, JPEG2000 formats. It directly convert PDF files to JPEG, JPEG2000 image formats, it retains the layout, images, text, line, ellipse, color, and formatting of the original PDF file. Mgosoft PDF To JPEG is a fast, affordable way to batch convert PDF files to JPEG, JPEG2000 formats. It directly convert PDF files to JPEG, JPEG2000 image formats, it retains the layout, images, text, line, ellipse, color, and formatting of the original PDF file. Mgosoft PDF To JPEG does NOT require Adobe Acrobat, and original PDF formatting and interrelation of text and graphical elements on each page. Creating documents which can be viewed on any computer with a Image viewer. And you can set the image quality, image color, image resolution, etc.